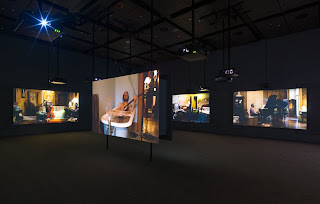 I had a strange experience walking through “Soundtracks” a group exhibition at SFMoMA that focuses on sound and space. I couldn’t stop thinking about what each piece looked like. I know that sound is something we cannot usually see. It requires that we use other senses: hearing, and, rather strangely, our sense of touch, as sound waves travel through our bodies. We primarily receive information through vision, especially in the age of screens and monitors. We aren’t used to paying attention to sound in any kind of nuanced way and the fact that I immediately wanted to translate it into an image was perplexing to me. So, I guess I was at the right show. 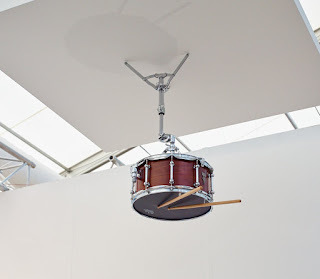 Anri Sala’s Moth in B-Flat is a red suspended upside-down drum. It’s the first piece we see, or encounter, when we walk through the show. Sala’s work seems to promise that the sound will reveal a hidden aspect of the visual, a hidden quality of the space inside the drum. One can find a lot of puzzled people around Sala’s piece. Why is the drum in the air and how is it working? The drumstick is constantly producing sound without any visible help through a playback device and amplifier hidden inside it. That creates constant vibrations, which sound like drumming. Moth in B-Flat made me look for a drumming pattern. People around me were saying that the work has a motion sensor or one needs to stay in a specific place to make it react. Everyone was trying to figure out the pattern, which is a big part of a drum based music. And that pattern does exist but it is organic and unpredictable rather than man-made and controlled. New sound waves produced by the amplifier constantly interfere with the old ones. I would argue that in the greater scheme there is a pattern to this process, as nature tends to repeat itself. However, usually that process it is too complex for a naked human eye or ear. The work really made me question the source and origin of sound. After confronting Sala’s piece, I started to think of sound as vibration. 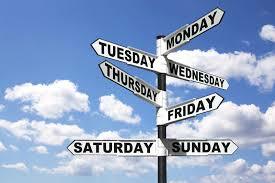 It is not something we think about in our daily lives. Moreover, ears are not the only part of our bodies that can pick up vibrations and translate them. As a matter of fact our whole body is an instrument able to feel and experience sound. Sergei Tcherepnin’s piece Stereo Classroom Chairs is a shining example of our bodies being attuned to the non-visual world. Is this the art of sound? 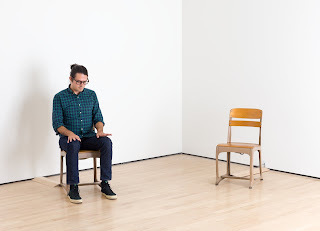 In Tcherepnin’s piece two wooden chairs are set up in the corner of the room. He attaches a transducer to the underside of each chair causing them to vibrate, though it’s not noticeable to the eye. Once I sat on one of the chairs my body immediately "heard" the sounds that the chairs were producing. At first, it is hard to understand how to listen to these sounds which have no visual, but also, most importantly, no acoustical representation. Nonetheless, as I sat on the chairs I started to recognize a composition that had its loud and quiet moments. Tcherepnin’s piece made me adapt to it and notice a new kind of information that is sound that isn’t sound. And what’s interesting is that this information surrounds and passes through our bodies all the time. I noticed how many people overlooked the piece. I think that happens because of the lack of any type of visual enticement or obvious sound. That’s not a problem with Tcherepnin’s art, but rather a problem of our visual heavy society. It always disregards the fact that there might be something more to an object hidden from plain sigh. Instead we immediately throw ourselves at the largest and brightest objects in a room. In fact, in the same room with Sergei Tcherepnin’s Stereo Classroom Chairs there is piece by Christina Kubisch—Cloud. 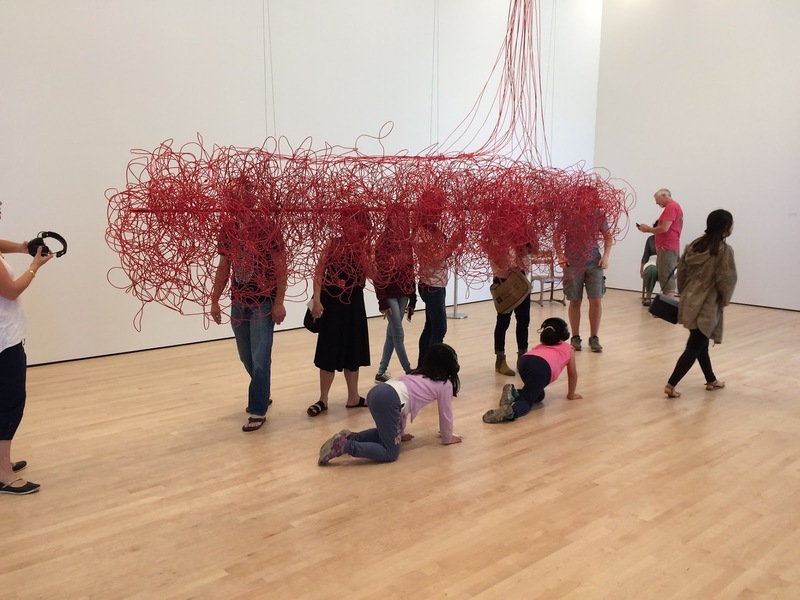 The work consists of a large suspended sculpture made out of bright red electrical wire and wireless headphones. Through the headphones viewer is able to hear recorded magnetic fields that circulate inside the wires. The recordings are from different locations, including Yerba Buena Gardens, Epicenter; San Francisco Seismic Safety Center; a power plant in Finland; server rooms in Austria, Germany, and Hong Kong, and a Louis Vuitton store in Paris. Recordings also feature the electromagnetic sounds of Nam June Paik’s TV Crown. What are we hearing here? Walking around the sculpture I was able to control a sound composition using different magnetic fields. I felt a sense of discovery while being inside this invisible sound space and experiencing combinations of sounds. Whenever the sound was too quite I would take a step closer to increase the volume and a step back when it was too loud. And when I got tired listening to one thing, all I had to do was take a step to the side to create a new composition. However, the bright red wires seemed more decoration than a part of the piece. I don’t see how Cloud’s appearance is supposed to change my perception of sound. Moreover, it is one of the reasons people missed Sergei Tcherepnin’s piece, as they tended to go for a large obvious work of art. In my opinion, lacing these two artworks in one room was a curatorial mistake. In another room I found Clinamen v.3, an installation by French artist Céleste Boursier-Mougenot. It is named after a phenomenon of unpredictable swerve of atoms (proposed by Lucretius in defense of atomistic doctrine by Epicurus). 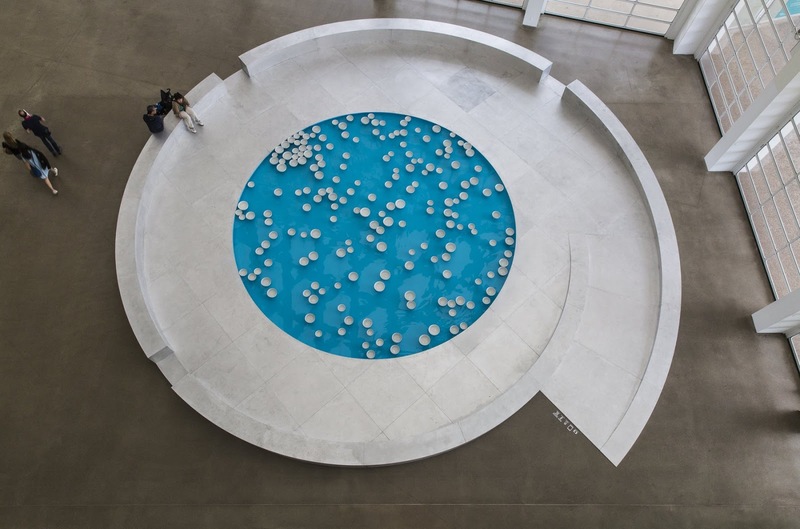 The installation is essentially a blue pool full of empty white porcelain bowls of various sizes. The bowls are slowly and constantly circulating, clinking together to produce a sound that varies depending on the size and speed of the colliding bowls. Clinamen v. 3 creates a dreamy and meditative environment, as if we were in a village far away from the big cities. The sound of porcelain being washed in a nearby lake is the only thing I could hear. It put me into a tranquil state. Partially because Boursier-Mougenot’s piece is not just physically large, but also takes up the whole negative and mental space of the room that it does not have a beginning or ending. 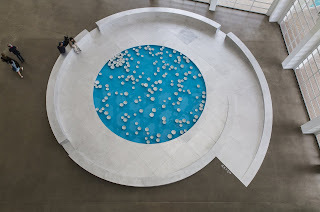 The sound endlessly resonates within the space and will exist as long as the piece is present in the museum. Most importantly, it successfully combines visual and acoustic representation into a truly transporting experience. What sort of visitor is this? Somehow the work manages to provide an intimate unique experience while placing numerous people in one space. This is one of the rare instances when I want to say beautiful and mean every single letter of this word. 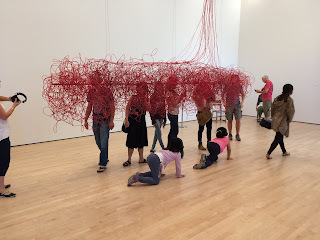 I found myself and other people overwhelmed by visual, sonic and environmental presence of the work to the point where I could see the wonder in their faces. I was completely disoriented. I did not know which screen to pay attention to: a woman with accordion and strange unearthly voice, or a tall bass player who would switch to banjo now and then, or a naked Kjartansson in a bath tab, or maybe someone else? But this disorientation made me walk around the installment and see all the people who were present in the room. As I watched people bond on different screens through music I experienced a sense of community. Towards the end Kjartansson’s work gathers scattered viewers in one place leading them from one projector to another reinforcing a sense of bonding. We can sense that there is going to be a big reveal, which is a reward for staying an hour or so in one place. After giving myself a week long break to think about the exhibition I came back to see and hear it again, and trust me it is worth coming back at least one more time. I tried to figure out how important the visual elements to the pieces are and does it play any other role than being a part of the overall design of the exhibit? There are pieces that exist without any visual support, like Sergei Tcherepnin’s work. 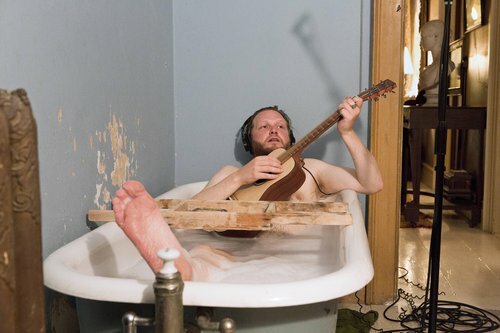 There are artists whose artworks successfully combine both acoustic and visual aspects together -- Anri Sala, Ragnar Kjartansson, Céleste Boursier-Mougenot. And then there are some for which the visual elements are a drawback, such as Christina Kubisch’s work. Nonetheless, all the works in the show are in conversation with the visual world. No matter what piece I experienced, I was constantly aware of its visual correlatives, each work’s physical shape and presence. So, for me the question is whether its possible to create a work without visuals. Could we learn to just listen?